The Summer Olympics are an exciting time! It’s a chance for people to travel from all over the world, and gather in one place. This year: London, England. And as usual, Pacific Islanders will be there in strong form! As many Oceanic nations are small, so are their teams. With less athletes, their chances of bringing home a metal are slim. That’s why these teams best illustrate the Olympic Spirit! They go to the Olympics to try hard and give it their all. What matters is that they are true to themselves… and have a good time! Fiji is bringing nine athletes to compete in archery, athletics, judo, shooting, swimming and weightlifting. Judo competitor Josateki Naulu will be the proud flag bearer at the Opening Ceremonies — he won gold at last year’s Pacific Games in Noumea and the Oceania Judo Championships in May. All the best, Josateki! Helema Williams will carry the flag of the Cook Islands. She will lead the 11 representatives of the Cook Islands. Helema will be competing in sailing, but she comes from a family of pearl divers! A true Oceanic Olympian! The Solomon Islands will also send a small but mighty team — four in all. They will compete in sprinting, weightlifting and judo. Papua New Guinea and Samoa are both sending 8 athletes. At the 2008 Paralympics, Rabaul’s Francis Kompaon won Papua New Guinea’s first ever Paralympic or Olympic medal when he took silver in the 100 metre sprint. Way to go, Francis! 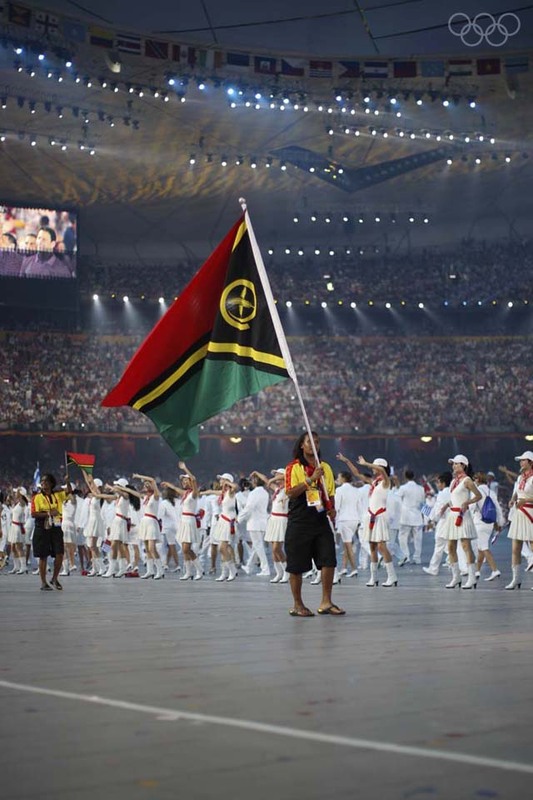 Finally, there will be five Ni-Vanuatu in the crowd next week. That’s two more than the last Olympics! I’ll be cheering for you, Vanuatu! Yufala i gat fulap hart, mo mi ting se hemi makem yufala is kam strong. New Zealand, of course, is a pretty big country. Do you know how many atheletes they are sending? 184! Kiwis will compete in over 20 categories. They are topped by Australia, though, who are competing in all but three categories. With all those athletes, Australia is sure to make a strong showing in London. Whether they’re on a big team with fancy uniforms and sponsors, or a tiny team with modest accommodations and few coaching staff — the Pacific Islander Olympians are sure to bring the genuine, loving spirit of Oceania to London.